Watch this mom perform her banjo Wildwood Flower and Cripple Creek for the joy of her baby. Isn´t it lovely? No doubt listening to music affects all people, and babies are no different. There is definitely a positive influence on the single fact of music listening on children. And even more on children learning an instrument. There aren´t actually many studies to prove this, but my personal experience on talking to piano, guitar or banjo teachers is that they feel their students are on average better at their school than the rest of their classmates, specially on maths. My personal opinion shares this feeling. When a kid decides to learn to play the banjo, it is really important to start with a well set up instrument, specially with low action that can ease their still weak fingers job and let the music come out in a smoother way. No matter if you want your kid to start playing banjo, there is some investment to be made in order to void quick frustration. Cheap instruments will mean your kid will have a harder job on getting any clean sound from his playing and will tend to leave the instrument learning before even starting. Sizes. There are banjos for kids from about 5 years old in really short scale. 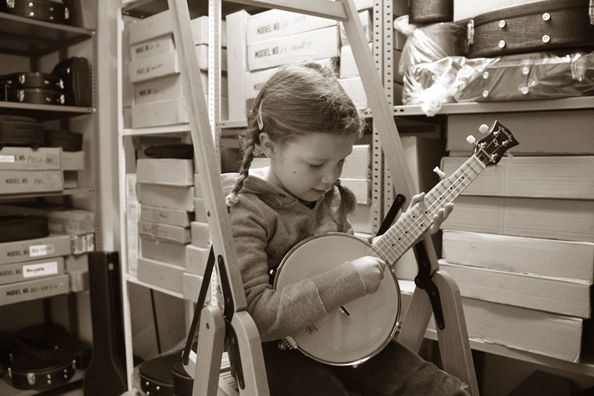 Travel banjos have slightly larger neck and are great for ages over 7. Travel banjos can also be used for adults as practice banjos as well. One more thing; don´t expect your child to be Tommy Mizzone. Let him enjoy the banjo learning (specially to the younger ones). Try to make him love music and don´t push in any way. He/she may not like it or may not be as talented in banjo as we would have wished. Well, he may be a great doctor, football player or whatever other thing he may enjoy more.